There are times in our digital life that we need to troubleshoot our mobile device or smartphone and make them accessible again. For some, the safe mode has become one of the most popular ways to troubleshoot the mobile device. Safe mode allows users to use their mobile device quickly. But safe mode is limited and might work only on some certain scenario. Another popular and effective way to fix troubled device is the factory reset. For starter, a factory reset, which also known as formatting and hardest, is embedded software that allows users to restore a certain electronic device to its original system state or default factory setting. Some people described it as the last sort of action to recover your Android phone from total failure. In factory reset, we delete everything stored on the device, which includes contacts, photos, videos, call history, text messages as well as settings and installed applications that were previously in the mobile device, in an attempt to restore the mobile device to its original manufacturer settings. 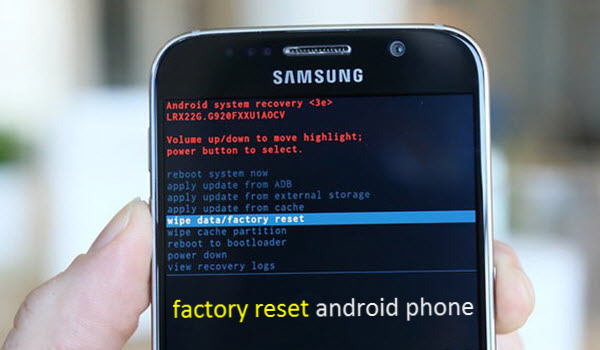 The factory reset is said to be one of the most effective ways to recover the device from total software failure. It can address and fix many chronic performance issues, which include Android flashing, application crash, software lagging, freezing things in the mobile device, malfunctioning software and many more. And more importantly, a factory reset will not affect or delete the mobile device’s operating system (Android or iOS), leaving your device’s operating system intact and safe. Why do users need to reset their phone to factory settings? There are many big reasons why many people perform a hard reset in their own devices. An important reason is to fix a malfunctioning device and clear the previously configured setting of the mobile device to the default settings. Factory reset is also effective in removing virus or malware that are difficult to remove. We also use the factory reset to effectively clear the memory space on the mobile device. Others use factory reset to remove personal information from the mobile device before selling them or giving them to anyone. 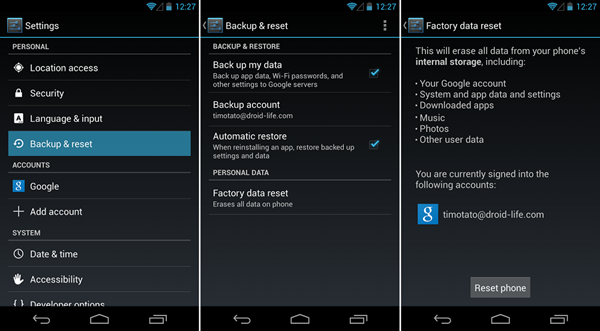 How to perform a factory reset on Android phone? Factory reset is no longer new to mobile users. It can be achieved in many ways depending on the mobile device’s operating system (Android, iOS, Windows Mobile OS). But mostly, this could be done by going into the device’s Settings or service menu. However, not all Android devices have settings in the same place or service menu. You need to see your manufacturer’s support site for some device-specific instructions and guidelines. Step 1: The first thing you need to do is to open the mobile device’s Settings app. Step 2: In the Settings app, tap System and then Reset, but if your settings are different, tap Backup and Reset. Step 3: Enter your PIN or password, if the system requires you to enter those security credentials. Step 4: If the system asks you to clear all the data stored in the device’s internal storage, tap Erase everything. Step 5: After you finished resetting your device, select the option to restart the device’s operating system. Step 6: Finally, set up your mobile device and restore your backed-up data. Tip: If you have some trouble or difficulty accessing your device’s Settings app, you can try factory resetting using the device’s power and volume buttons. However, restore factory settings must be performed with caution, as it effectively erases all data stored in the mobile device. 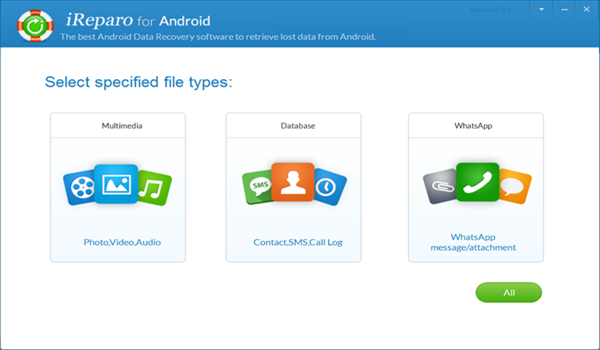 How to restore data from Android after factory reset? Normally, you can restore data from backup. However, what if you forget to back up your data or if your backup file is lost? Step 1. First, download, install and run iReparo for Android software on your computer. Step 2. After that, select the file types you want to restore, then click Next to begin. Step 3. Then enable USB debugging and connect your Android phone to the computer. After connected, tap Start to scan the deleted data. Step 4. Preview the deleted data listed in categories, then tap Recover to get them back.